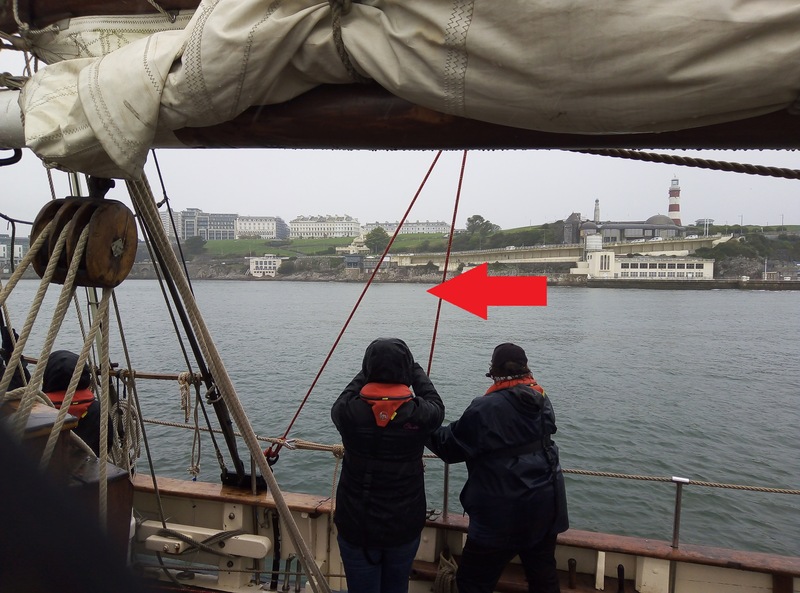 For the second season of running day trips for children with disabilities in Plymouth’s estuaries and the Sound, we picked a new name for the project to show that the Cornubia legacy was firmly embedded in The Island Trust; hence “Ocean Discoverability”. Pedants might cavil that “discoverability” is not a real word, although in geekspeak it refers to the ability of a website to be discovered. In our context it is the children (and their carers) who are being given the ability to discover, in this case, the ocean. 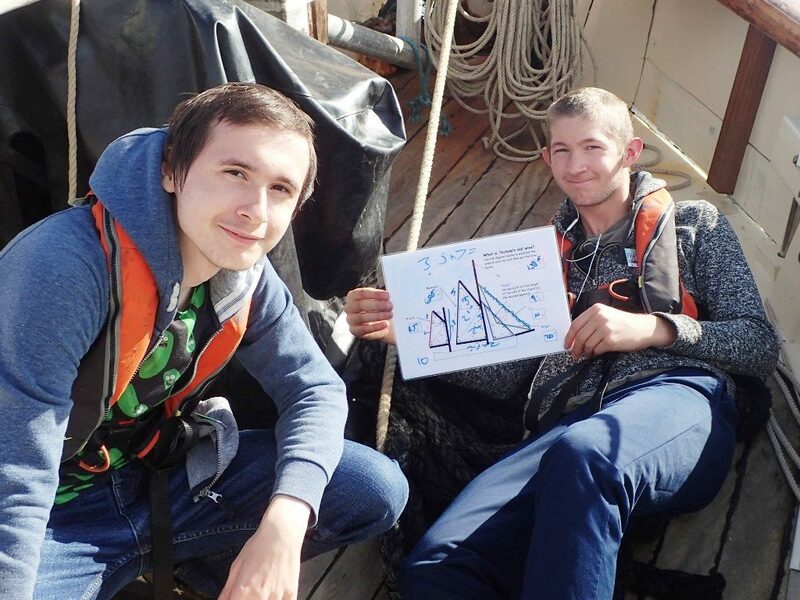 The ocean is at the heart of the educational elements of these voyages – what lives in it, what we do with, in and to it, and what it does for us. These counting cards followed a suggestion last year by Jenny, a teacher at Cann Bridge. City College Plymouth, justifiably smug as the first ones to get it right this year. The next day, and the last of the season, the Horizons’ starboard watch got it right too. 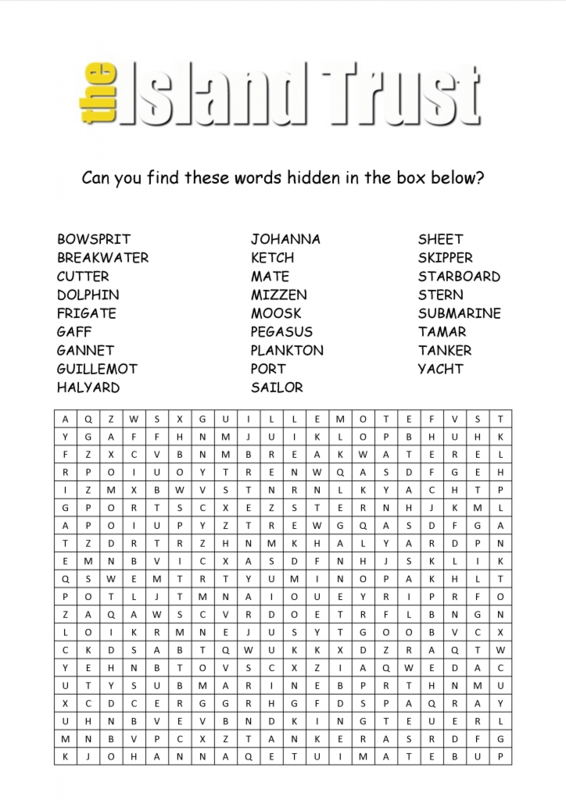 …a word search. Click on the image to download a pdf. Looking for International Code flags, and an alphabet hunt. 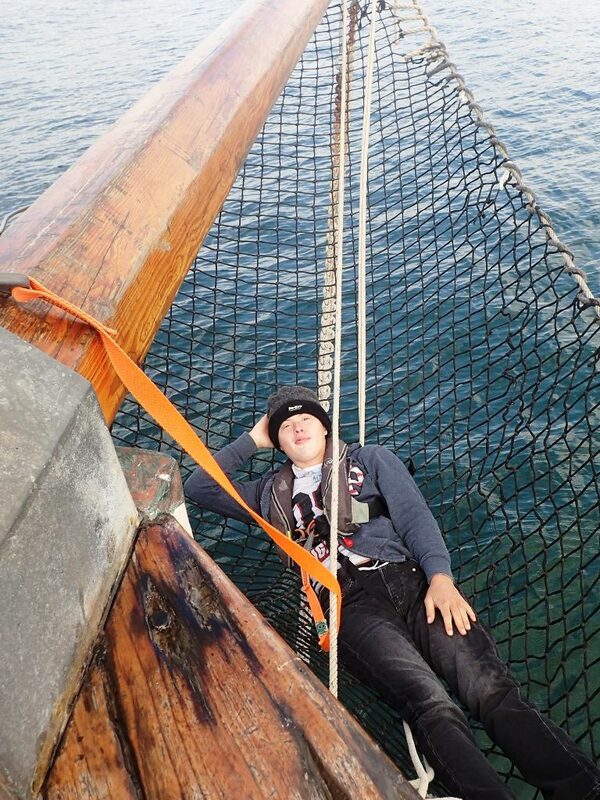 25 points for another gaff-rigged boat, even if it is Moosk, one of ours. That small dot at the end of the arrow really is the seal. 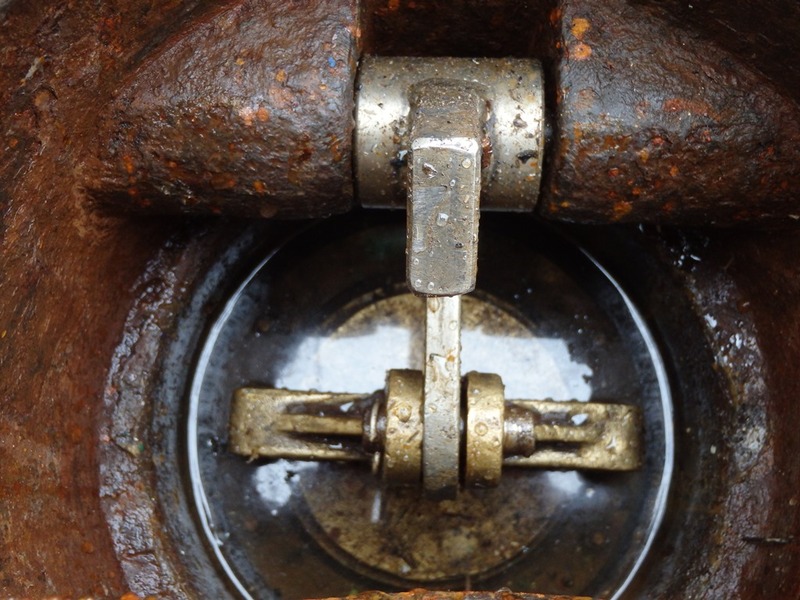 The mechanical bilge pump is the most difficult to find. 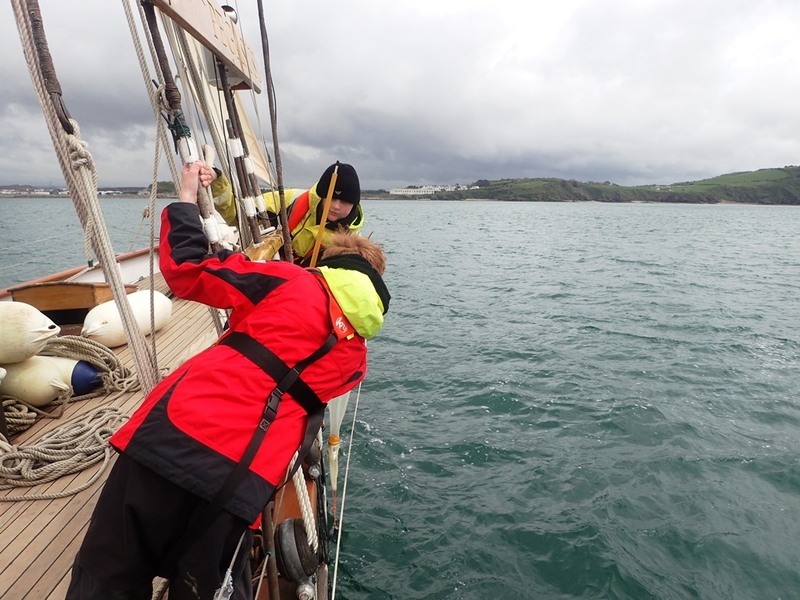 But having found it, Plymstock school had the chance to try it out. 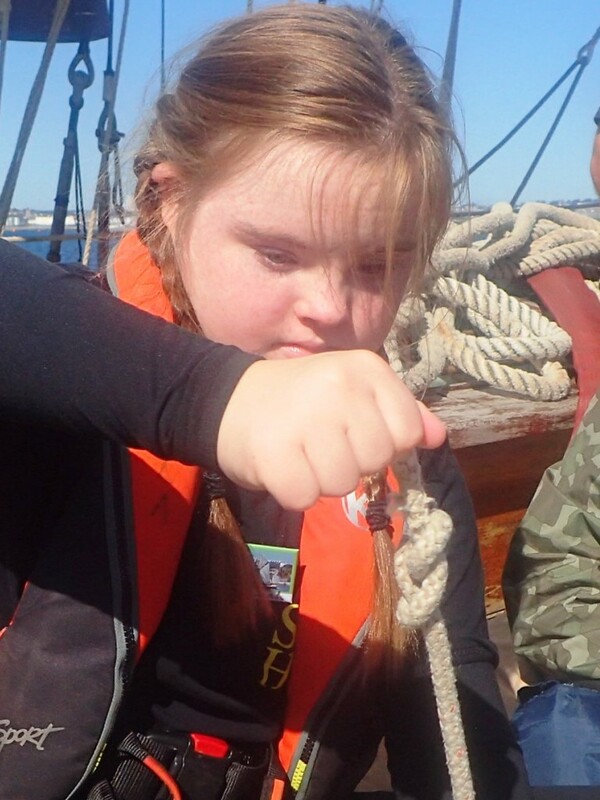 Jemimah from Pencalenick was quick to learn the figure of eight knot. None too small to steer! Some overcame fears and went away with new confidence. “I was frightened and didn’t want to come as new things scare me. I really enjoyed it and I am definitely not scared any more. 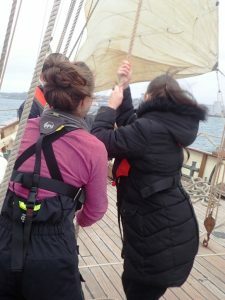 I want to sail more,” said Rebecca from Pencalenick School . 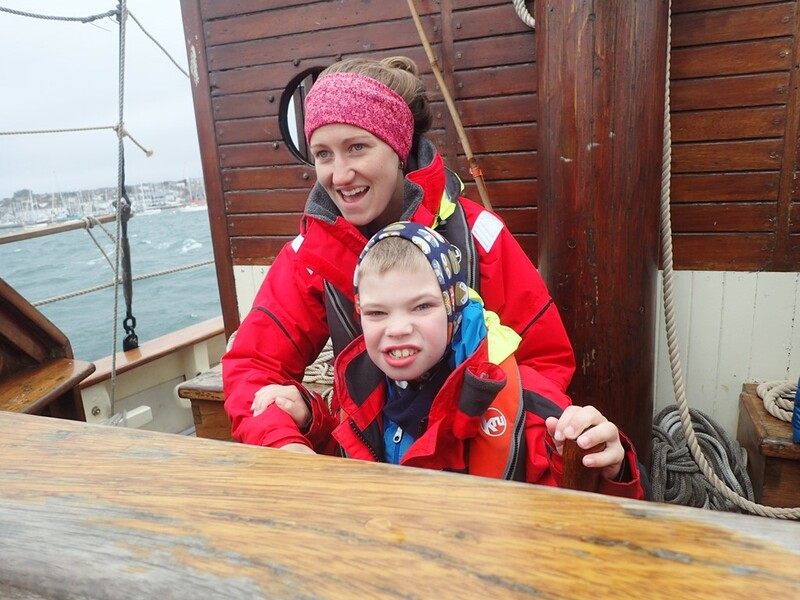 2018 saw records broken with 128 children and 50 carers from 13 different organisations sailing with us. This year we used the gaff cutter Pegasus (the same rig as Cornubia) as well as Tectona, a gaff ketch which had hosted all the trips in 2017. The crews of both boats welcomed the youngsters on board with warmth and sensitivity, and seemed to enjoy themselves just as much. 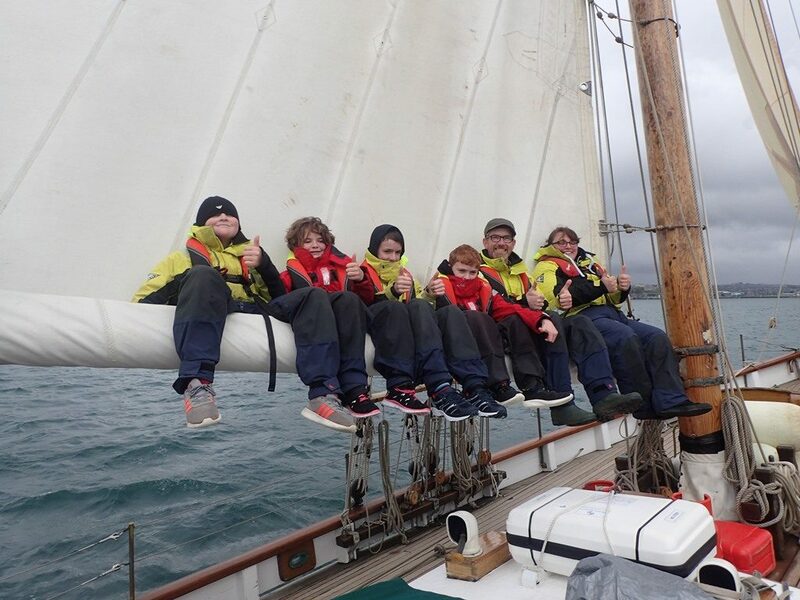 Eggbuckland Community College enjoy a lively sail in Pegasus. 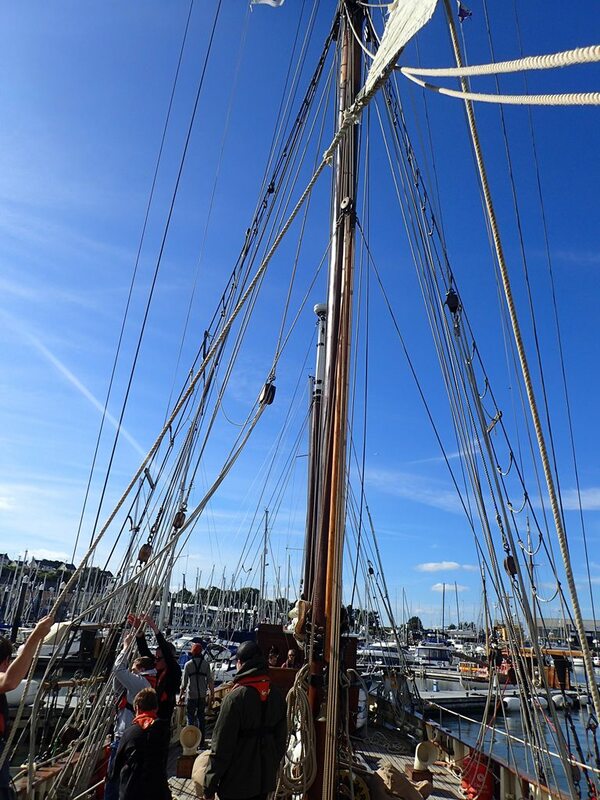 Tectona making stately progress, well reefed on a windy day. 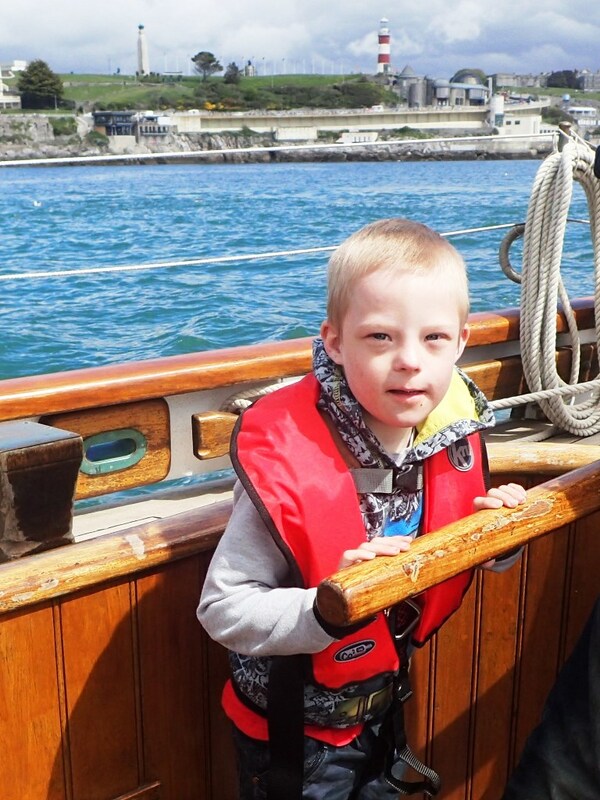 Many of the children like steering best. First mate Jen likes helping them too. 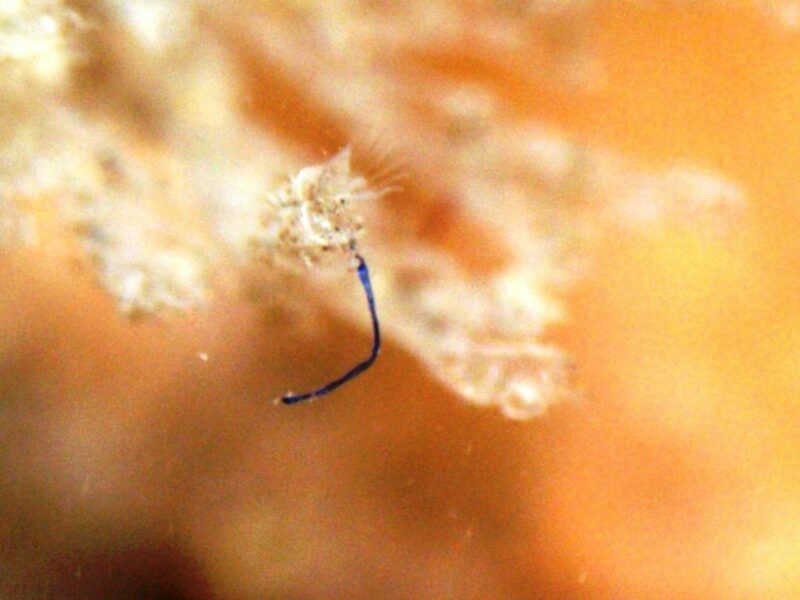 A strand of microplastic snagged on a bryozoan. The programme is essentially the same. The day starts with examining life on the pontoon, which illustrates so much of the whole ocean process, including human impacts. 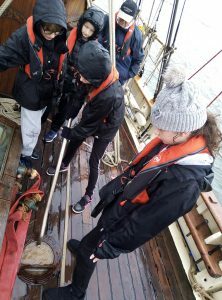 On board we look at some of the smaller creatures we find there, like barnacles, worms, hydroids, bryozoans and sea squirts. Watching crabs squabbling over the bait on the seabed on the TV screen in the saloon is always a great hit. 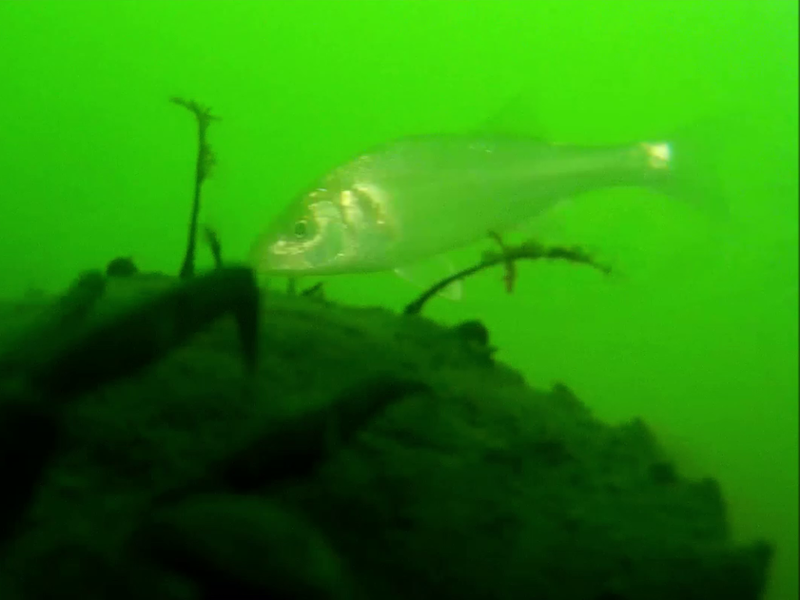 Bass photo-bombs a squabbling crab. 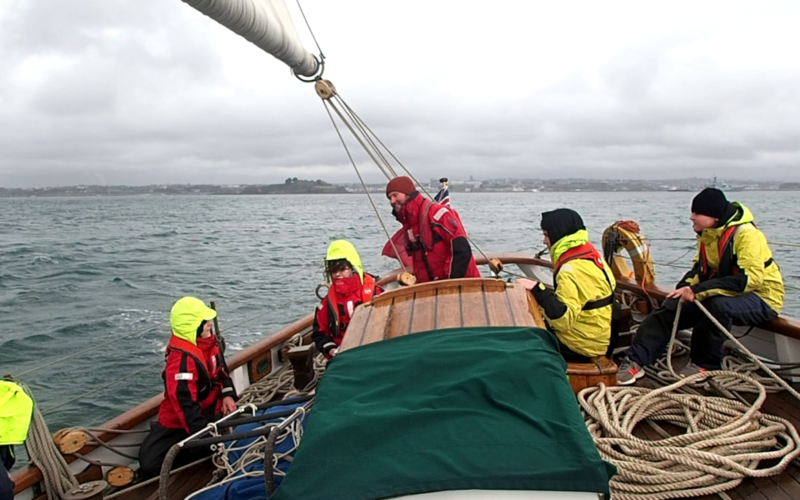 After dividing the children and staff into port and starboard watches, and safety briefings, we get under way. 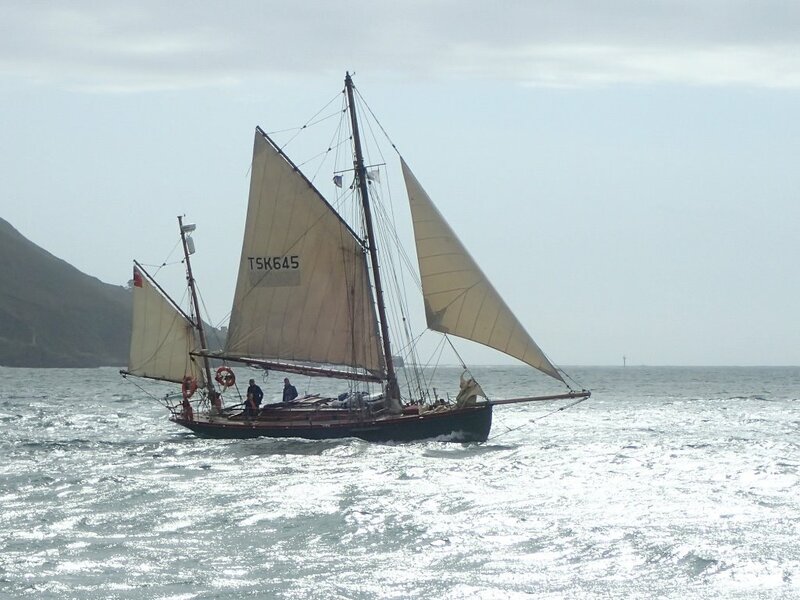 If the wind and tide are really kind we do that under sail (twice!). 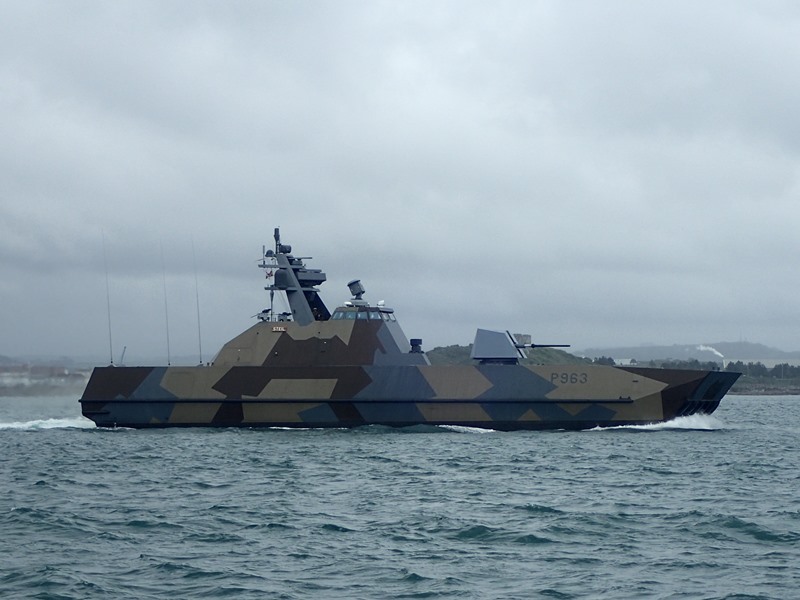 Under less benign conditions we might need a nudge off the pontoon from the RIB. Unlike last year, this year there were no days when we could not get out. We usually managed a trip under power up the river, before going into the Sound to do some sailing. 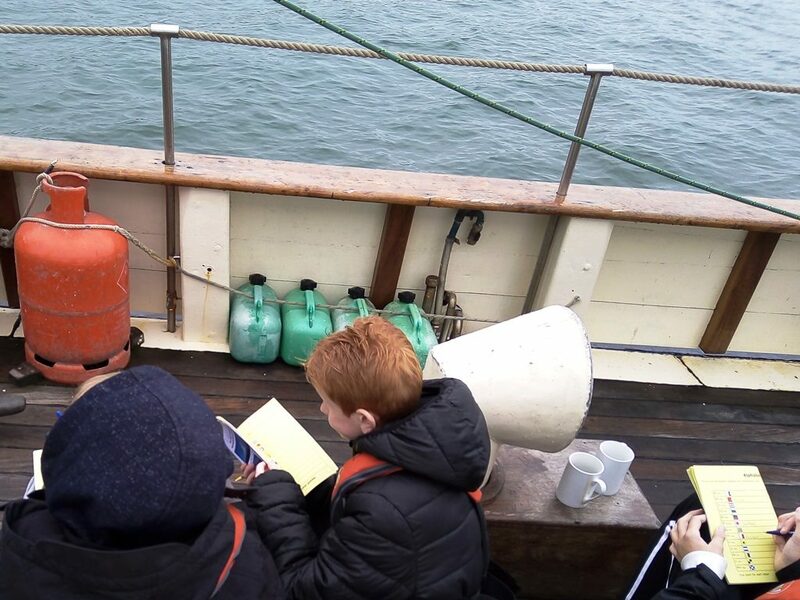 On most days we were able to trawl for some plankton to look at through the microscope to complete their tour of the ocean food web. 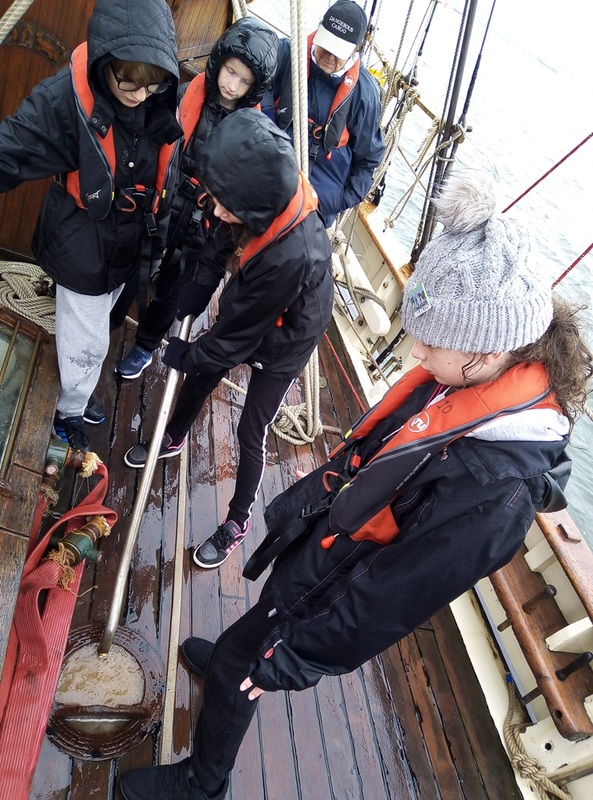 The vertical plankton trawl provides a good opportunity for the young crew to discover the virtues of team-working, and maybe some different creatures. 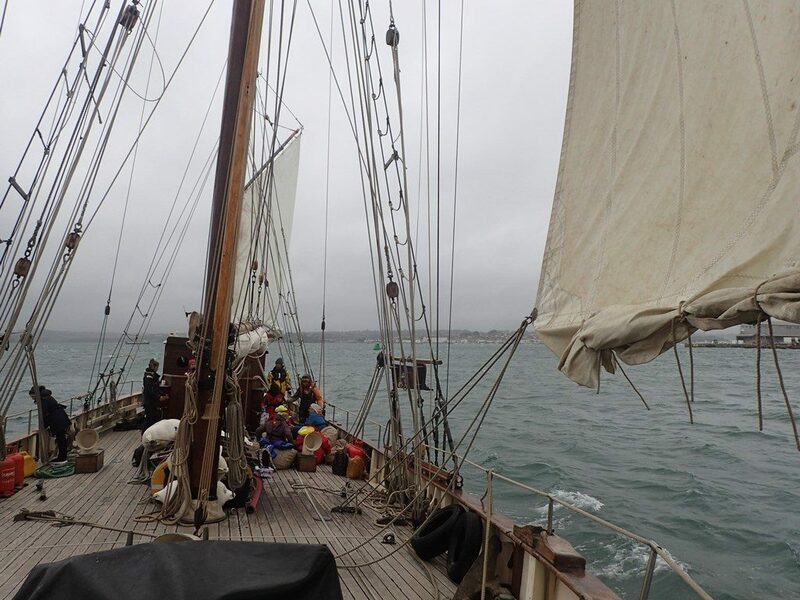 Sailing off the berth with Mount Tamar School. Passing the net forward is easier if you share the work. 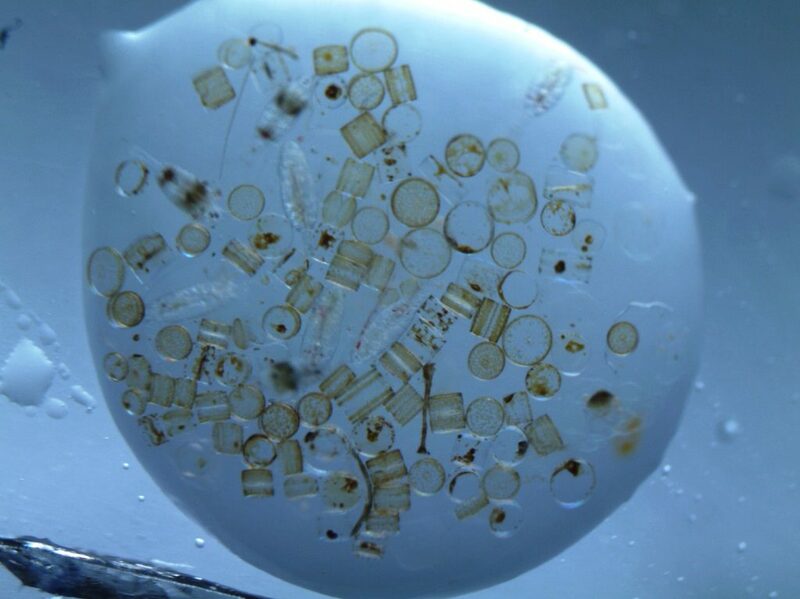 Plenty of plankton to study in this drop of water. Some schools have greater transport problems than others which curtail the time they can spend on board. But the schools are adamant that even a short day is worth the time and effort they put in to get them to Plymouth. They should know, they keep on coming back, and we will continue to welcome them. Two members of staff from schools sailing with us for the first time, wrote to us afterwards to say that the effects on the confidence of their youngsters are long lasting. 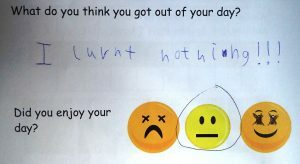 What did the youngsters themselves think they got out of their day? Some recognised that their confidence had improved, too. “I was very worried about coming and so was my mum. I now know I can do these things and enjoy joining in.” (Jack). 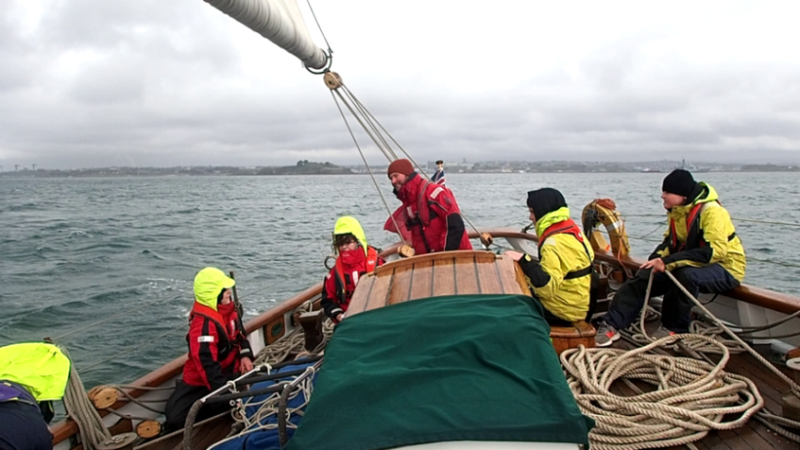 Others just enjoyed themselves; some because of the activity: “Loved waves, steering, pulling up the sail.” (Jasmine). 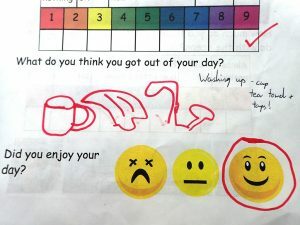 Zakir liked washing up, as his pictogram feedback shows. Others found contentment in the sensory experience: “I loved the rocking and friendly faces.” (Evie). We didn’t manage to please everyone, though! 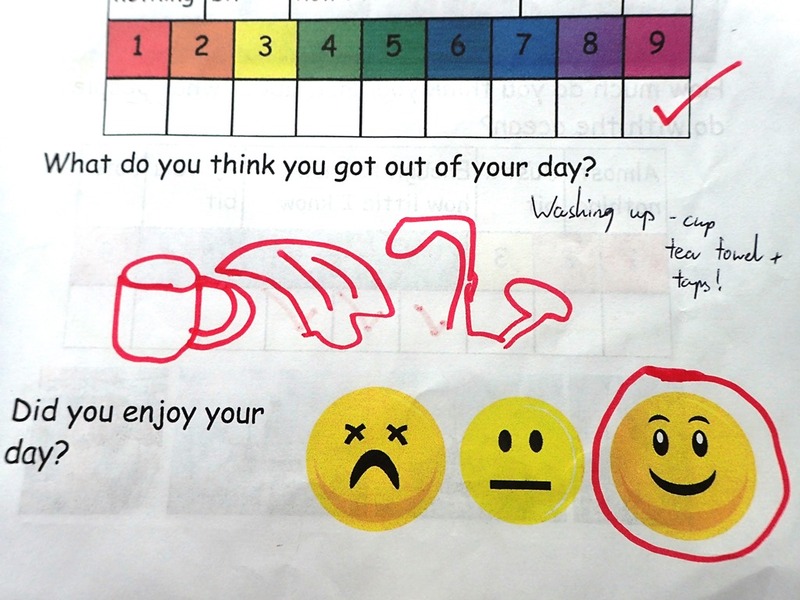 Satisfaction for the children was 93%, with 7 neutral or not completed, and 1 who did not enjoy their day. All the accompanying adults enjoyed their day. Eggbuckland students ready to go about. These days would not have been possible without the generosity of a wide range of institutional and private funders to whom we are very grateful. 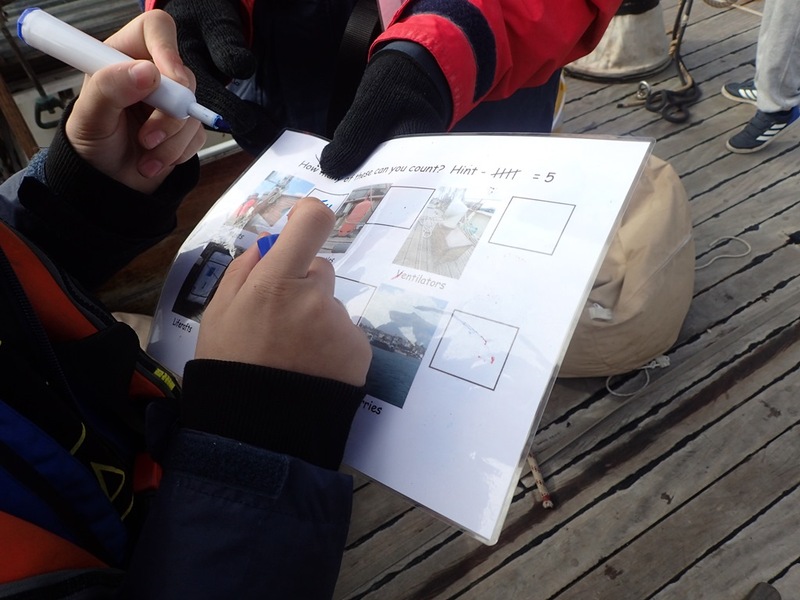 Thanks are also due to organisations who have given advice, assistance and support, including help with identifying obscure sea creatures and plants.